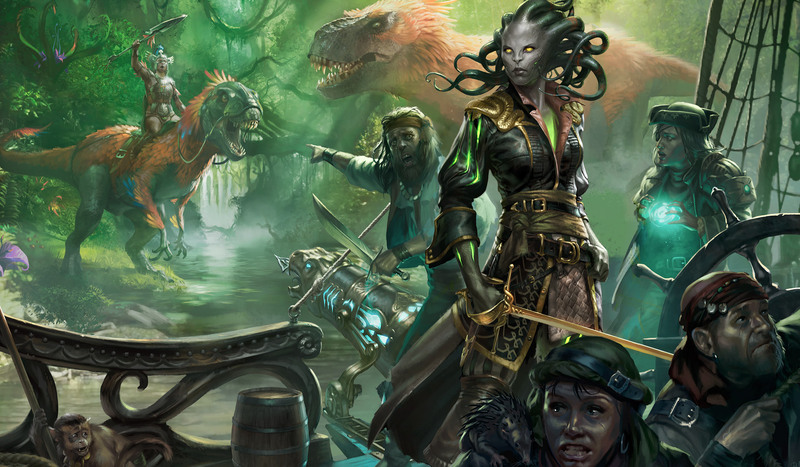 Ixalan is the latest set for Magic: the Gathering, and the first set in Ixalan block. Ixalan is a wild plane, the home of dinosaurs, merfolk, and the abode of pirates. Double-faced cards make a return in Ixalan, with a twist–all double-faced cards are artifacts which flip into lands with a beautiful new card style! This is a sealed deck event where each player will receive a special kit containing six packs of Ixalan, a promo card, and a spindown life counter. Continuing in this set, ANY rare or mythic rare can appear as a date-stamped promo card! Each player builds a 40 card minimum deck from the cards in their kit and basic lands (bring your own or use ours). There are four separate events throughout the weekend. Sealed deck at midnight Saturday, Sealed deck at 11AM Saturday, Two-Headed Giant Sealed at 4PM on Saturday, and Sealed deck at 11AM on Sunday. Pre-registration (at the store or over the phone) is STRONGLY recommended. Pre-Release events are very popular and have sold out before. Avoid disappointment and pre-register early! In addition to guaranteeing your spot in the event, pre-registering and pre-paying will give you TWO entries into the door prize giveaway. Pre-register and pre-pay for 3 total events across the weekend and receive THREE door prize tickets per event! Door prizes will vary by event, but contain exciting prizes. There will be 3 total swiss rounds with prize payouts based on your overall record in the event. In addition, each player who wins a round will get a free draw from our special Promo Board of Mystery! The Board of Mystery will be seeded with lots of promos from previous releases, including some special surprises!